... you want to throw a SuperBowl party just to try out fun appetizer recipes and feed a bunch of hungry people. 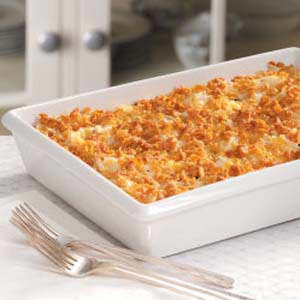 Also, call for recipe: I have never made that cheesy potato casserole thingy with the corn flakes on top. Never in my life. I have no idea what's in it, besides the fact that every ingredient must be sinful. Please send it my way if you have a good one. Maybe I can adjust the amounts and sub ingredients to achieve a good balance of health and taste??? His 'birthday cake' this year is slider cupcakes. I LOVE THEM! They'd be great for a kids' birthday. ...Or The Stallion's birthday. I sent them to work with The Stallion today, too. Just like a little kid. They're SO easy. I bet you could figure out how to make them just from the picture. 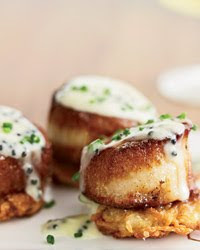 Anyway, point is - I'll make scallops throughout the year; not as often as The Stallion would like, but I'd still make them. Cheesy potato casserole? That falls under the baking mantra, which I suppose I should now label the Sinful Comfort Food Mantra (make it and take it; make it and TAKE IT AWAY). 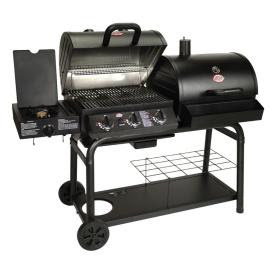 The 'most awesome grill in the world'. Half charcoal, half propane. 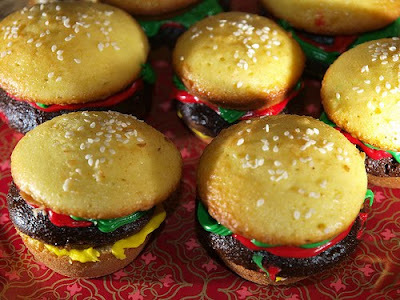 A bit more stallion-like than the slider cupcakes, eh? Happy Birthday to your fiance! Thanks for the compliment. I loved that pic too. I have several from that day that I love. The light must of been great or something. I will put up more today or tomorrow. I ended up getting the Nikon D40. I love it, and I don't need to do anything too fancy, so it is perfect.